Schematic view of a single-photon source. 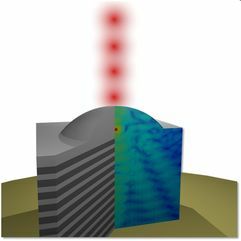 A single quantum dot is sandwiched in between a distributed Bragg reflector and a deterministically fabricated microlens for an enhanced photon-extraction efficiency. The research activities of our group focus on quantum optics, quantum light sources, and optoelectronic devices based on micro- and nanostructures in III-V semiconductor materials. Of particular interest are quantum dots that provide zero-dimensional carrier confinement and as such can act as single-photon emitters with very high quantum efficiency. These unique features are exploited to investigate light-matter interaction effects in the framework of cavity quantum-electrodynamics (cQED). For this purpose, the quantum dots are integrated into optically- and electrically-driven low-mode-volume micro- and nanocavities to control and enhance their emission features. The related cQED effects allow us to develop building blocks for future quantum communication systems such as efficient quantum light sources and low-threshold microlasers. We also develop lithographic techniques for the deterministic 3D structuring of semiconductors for enhanced on-chip functionality (cf. schematic images on the right). 05.04.2019 - "Mutual coupling and synchronization of optically coupled quantum-dot micropillar lasers at ultra-low light levels"
26.03.2019 - "Micropillar lasers with site-controlled quantum dots as active medium"
13.03.2019 - "Wigner Time Delay Induced by a Single Quantum Dot"
11.09.2018 - "Millionenförderung für TU-Nachwuchswissenschaftler"
30.7.2018 - "Spezieller Detektor misst die exakte Anzahl von Photonen in einem schwachen Lichtpuls"
25.7.2018 - "Synopsis: Counting Photons from a Polariton Condensate"
20.7.2018 - "Neue Anwendungen für Mikrolaser in der Quanten-Nanophotonik"
15.02.2018 - "Lasing am Limit"
10.02.2018 - "Schlüssel aus dem Schub"
26.01.2018 - Nature Photonics Research Highlight Report zu "Dark exciton study"
25.01.2018 - Publikation "A stand-alone fiber-coupled single-photon source"
16.01.2018 - Publikation "Accessing the dark exciton spin in deterministic quantum dot microlenses"
25.08.2017 - "Unveiling the physics of microcavity lasers"
03.04.2017 - Publikation "A bright triggered twin-photon source in the solid state"
09.03.2017 - Publikation "On-chip optoelectronic feedback in a micropillar laser-detector assembly"
16.07.2015 - Publikation "Highly indistinguishable photons from deterministic quantum-dot microlenses utilizing 3D in situ electron-beam lithography"